Anyone who’s ever considered going on vacation knows that luggage is always a primary issue. In the absence of a portable mini wormhole, how can you hope to carry everything you need without feeling overburdened? Proper preparation plays a big role, sure, as does the ability to differentiate between things you need and things that might come in handy in a one-in-a-million scenario. But sometimes, all it takes is having a right bag for the job – here are some great ones to consider, sorted from smaller to larger. River Island Black Round Holdall: Who said purses were only for women? River Island’s black carryall combines the space of some smaller carry-ons with the handiness of… well, a handbag. If you packed your bag snugly but still have a couple of accessories you feel you can’t do without, consider using this handheld-yet-sizeable bag to bring additional goods with you. Best of all? Thanks to its all-black body and handles, the bag looks extra slick and will make you look like you mean business. Tumi’s Alpha 2: The company with a funky name makes some impressive travel bags, and the Alpha 2 is no exception. Think of it as a mix between a handheld carryall and a backpack or carry-on – if you’re not sure how long your trip will last, the Alpha 2 will carry all the necessities while still leaving room for the odd pack of bubble gum. Not to mention, the unique code that Tumi outfits each of their bags with will greatly assist in recovering your bag should it ever get lost (don’t count on the items inside, though). Herschel’s Highland: Ever felt like a part of you belonged in the army even when you were at your most comfortable pushing pencils behind a desk? Herschel has you covered: their Highland carry-on provides you with a convincing camo pattern without ever making you get up before dawn to run circles around the base. As for the inside, the bag has plenty of room and is designed in a way that prevents your items from ever jumping up and down. Gregory Mountain Backpack: Will you be venturing out into less-than-hospitable environments during your vacation? Consider Gregory’s backpacking wonder as your ‘bag’ of choice even for days-long hikes, plus it can double-up as an effective carrier in just about every environment thanks to its moderate size. Samsonite Hardside Spinner: If you aren’t one of those people willing to sacrifice style just because it’s time for leisure, you might want to consider Samsonite’s high-end Spinner as your bag of choice. The uncomfortably-high price is justified by the metallic ‘shell’ side that protects your stuff from everything short of a nuclear blast, not to mention that the design of the carry-on itself will definitely turn a few heads and leave people wondering where you’re taking this slick bag to. Eastpak Tranverz L-Wheeled: This bag definitely does a good job resisting categorization, falling somewhere between a duffel bag and a suitcase with an appearance that resembles a backpack. While the L-Wheeled’s exterior won’t be winning design awards any time soon, the bag does does its job exceedingly well by giving you a safe, sturdy and light carrier for nearly every type of vacation you could have. While rafting or tubing might be considered a bit of an extreme activity in some parts of the world, it’s a walk in the park for most Texans during the spring and summer. There are many magnificent rivers to float in the Lone Star State, each with its own properties that will cater to some individuals more than others. Here’s an overview of some of the top rafting places in the state – take your friends or family out to any of these and you’re all-but-guaranteed a good time. Neches River: The first choice for those looking for an adventure, Neches River is almost 20 miles long (which is 10 times longer than some entries on this list!) and every meter passed offers new adventures. You might not want to bring your family here, although many of the parts along the river’s side make for a perfect camping spot – instead, pick a handful of daring friends, put a sturdy raft underneath you, and you’re sure to have a wild and memorable time. Comal River: Perhaps the smallest and tamest body of water on our list, the Comal hasn’t lost a bit of its popularity as a tubing destination over the years despite the fact that the river’s size frequently makes it chock-full of people (some of whom might be enjoying the effects of too much alcohol). How? The crystal-clear water with a constantly-pleasant temperature helps, as does the fact that the river runs through a beautiful historic city that everyone can enjoy. Guadalupe River: The Comal’s bigger and badder sister, the Guadalupe is close and yet almost the exact opposite: even when it’s not being flooded, the river is long, quick and unpredictable, meaning that inexperienced rafters and tubers are smart to shy away from it. Thanks to its larger size, rafting here is no problem, although you’ll definitely want to make sure that everyone on the raft follows instructions lest the whole crew finds itself upside-down. Frio River: If you have kids who want to join you on the rafting adventure (or even hop on a tube themselves), Frio River is a great choice due to its year-round safety and wonderful scenery along its stretch. The constant flow and the natural sights will ensure that nobody gets bored, although you might find yourself dozing off in the tube because of how relaxing the environment is – if you do, make sure there’s someone around to wake you up when needed. San Antonio River: With a bit over six miles to its size, San Antonio River falls somewhere in the middle despite being the last on this list. Like many other Texas rivers, San Antonio’s pride doesn’t offer too much excitement or unpredictability and can generally be rafted through in no more than six hours. What makes this river stand out from many of its cousins is the sheer amount of animal life found throughout the banks – from impressive birds to not-so-commonly-seen land mammals, you and your family are sure to have a blast just guessing the names of every animal you spot. While some of us are quite content with spending most of our lives in a sedentary position (with the occasional stretching out over a comfy bed), it’s not what humans were built to do – our bodies are better-suited for long walks as would be expected from an essentially nomadic species. Many find hiking to be a great way of working around the comforts of the 21st century lifestyle. It’s not as strenuous as running or hitting the gym, but it’s also challenging enough even for those who are in shape – there’s no turning back once you’re in the middle of a hiking trail, and you better find it in you (and your boots) to complete the trail before collapsing. Due to its amazing hill country and natural scenery, Texas has no shortage of great hiking trails that will put your walking abilities to the test. Here are 4 that combine the challenges of proper hiking terrain with all the beautiful sights you could hope for. The Greenbelt Corridor: With all the talk about natural beauty, it seemed a shame not to include Ray Roberts Lake State Park’s gem as the first entry on the list. With fourty-some miles of trail depending on how far out you’re willing to go, the Corridor isn’t going to disappoint when it comes to its ability to give you a workout. Make sure to bring a camera, too, as you’ll definitely want to capture some of the sights on your road to fitness. Also, when you’re done hiking, there are plenty of other things to do in the area – fishing, kayaking and horseback riding to name just a few. Lake Mineral Wells State Trailway: Don’t underestimate the fact that the Mineral Wells Trailway is only ‘around’ twenty miles long – it’s sure to give you a workout on your way to the finish line, especially if you’re hiking during the summer. This is one of those trails that provide additional motivation for hiking aside from wanting a better physique and enjoying the countryside – from the many exquisite species of birds one can catch singing and nesting around the trail to the always-interesting National Vietnam War Museum, you’ll have no shortage of reasons to pick this trail over any other. San Antonio Mission Tour: Are you proud of your religiousness and enjoy taking every opportunity to get closer to the Lord? Well, here’s one way to do it that will also improve your overall fitness – traversing the San Antonio Mission Tour trail will introduce you to all of the most important missions, including four historic churches that remain active to this very day. Feel free to stop at any of the missions and have a look for as long as you’d like, but be warned – the ‘tour’ is a full-day one, and you better have a good idea of distance and time if you’re going alone and aren’t willing to spend the night out. Trinity River Trail: If you’re not one for wilderness hikes that make you feel removed from civilization, Trinity River Trail is the perfect combination of urban and rural. With over 15 miles of hiking trail, you can expect to walk for a good half a day, not that you should have trouble ending the hike prematurely thanks to the generally-urban surroundings – oh, and did we mention that the view of the river is something to behold? Nature can be harsh and merciless. The explorers of old had it right – thick soles do the feet good. While walking around barefoot seems like it could get you more in touch with nature, it can be a pretty bad idea – step on the wrong woodland critter and you’re toast. Now, we hear you – hiking trails aren’t exactly tropical rainforests with table-sized spiders and twenty-foot-long caterpillars. But even a tame-looking hiking trail can have its own dangers and challenges, meaning you should be well-equipped even if you think you’ll be taking a light stroll. Besides, there’s no telling when a hiking trail will get unpredictable, more difficult or downright dangerous, so your best bet is sporting some all-purpose hiking boots that will protect your feet against adversity. Here are 3 of the top rated ones – any one of these offers to turn you into a seasoned hiker as soon as you can tie the shoelaces. La Sportiva LS Trango Cube GTX: Trango Cube GTX – sounds more like a sports car than a pair of hiking boots, doesn’t it? For what it’s worth, the Cubes look a fair bit sportier than many other hiking boots you can find. In fact, the color scheme could be called futuristic – the blue-red-yellow touch with a plastic finish might be welcome by some and hated by others. Yet for all their funky looks, La Sportiva’s hiking boots carry their weight extremely well in virtually any hiking environment. Only figuratively, of course – for what they offer, the Cube GTX aren’t particularly heavy and should be handled well even by smaller individuals over longer distances. As for protection, it’s all there – dirt, rocks, slippery terrain, water and insects will suddenly look a lot less menacing with these babies on. S-Lab X Alp Carbon GTX: In line with the sports car titles, the Alp Carbon GTX is one of the best hiking boots on the market for several reasons. Let’s start with looks: the all-black body with a white pattern and slight touch of gray makes these seem like something a soldier or at least a well-dressed mercenary wouldn’t mind wearing, and they’re also lower-cut than most other boots with similar features. Speaking of soldiers and mercenaries, if you earn a living by traversing difficult terrain, don’t be afraid to give these a go – their light weight combined with impenetrable defenses will make walking through snow and water a breeze on top of letting you crush just about every type of terrain you could think of. 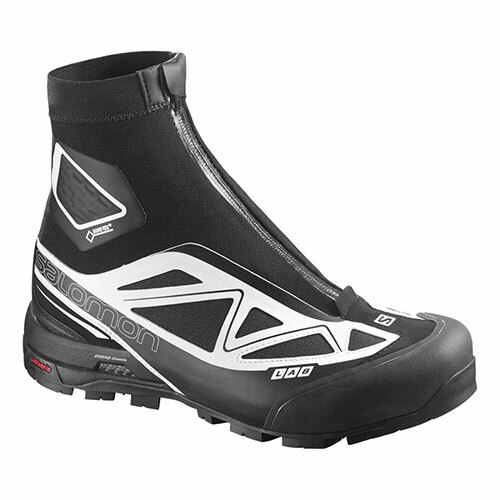 Hanwag Cengalo GTX: The last of the Fast and Furious-sounding boots on this list is far from being the least. In many ways, the Cengalo looks like a traditional hiking boot a lot more than the aforementioned innovators – tall cut with ankle protection, mild-mannered coloring and a sole that looks as if it can put a dent in concrete. Like the previous two entries, Cengalo excels at protecting your feet against every type of terrain and in any weather condition – from heaps of snow to springtime mud to summertime mountain climbing, these boots will make every adventure feel more like a walk down the grocery store. Hiking and Vacation Gear is getting ramped up to offer tips, gear and travel. Stand by to be blown away!